Artist: Daniel G. Beckett, Jr. 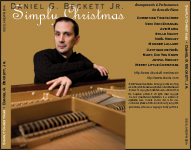 Description: This recording features Dan's arrangements and performances of favorite Christmas carols and standards. It highlights his characteristic piano stylings accompanied by a handful of Detroit-area vocalists and instrumentalists.